Journal, Cabinet, Multilingual Parlour, Untranslated Conference Room, Repository of Erudite Pastimes, even a Gymnasium for the Polemist and the Humorist; Consacrated to Oddities and Facts Concerning Peculiarities of Theatrical Amusements related to the Circus, Conjuring, Comedy etc. ; their Connections with Fine Arts; the Uncovering the Curiosities of their Past, and the Critical and Hopefully Provocative Account of what of Interest is Remaining of their Uncertain Present. Profusely Illustrated. The circus ring is always been the temple for every possible anthropomorphic feat for every kind of animal creature. Sharpshooter parrots, boxing kangaroos, athletic porcupines, hockey player bears, military monkeys, panthers riding yaks, horse riding bears, pyramids of panthers, soothsayer poneys, poker player poodles, clarvoyant pigs, tigers dancing with elephants, crocodiles wrestling with men, scorpions insidiating women, lions balancing on trapeze, hippopotamus ordering meals, rats driving a train, a rabbit fire brigade estinguishing the flames at a cat’s house, giraffes running along with rhinoceros, guitarrist gorillas, polar bears firing with rifles, elephants descending toboggans, girls fighting piranhas. You, as faithful followers of this blog, are likely subject to be exposed to few of those feats and more in the future. Today, we wish to remember one of the most impressive and spectacular feats ever obtained by the man with the animal. 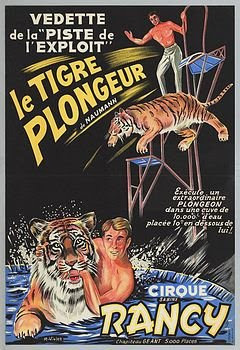 It is the case of the german trainer Heinz Naumann, that in the 60s presented around Europe and in the Usa his high-diving jump along with his tiger Rajah. Naumann was a former U-boot German marine. 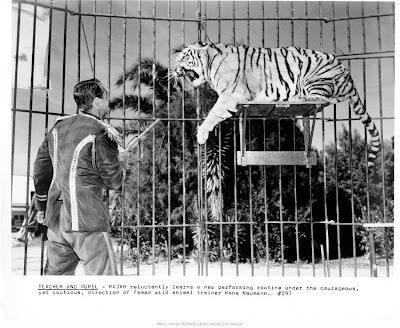 After being war prisoner, by 1945 he turned himself tiger trainer in South America. With a patient approach in growing tiger cubs, he was able to obtain exceptional results. We unhearthed an existing clip of his diving stunt, performed in Berlin Deutschlandhalle: it is very brief, just 19 seconds. As short and intense as a human cannonball performance, but worth to witness. Wonderful clip. I have heard about this act for years, but had never seen it before. Thank you for sharing it. I have always heard one of the son's received a severe injury from one of the tigers? This is my grandad!! Wow. Cool to see him there. Have you got any more footage? This is my grandad! Cool footage. Have you got some more? Impostor of the international stage arts, he is said out from a noble estinguished family of Southern Italy. From childhood he attempted escapes to the strolling life. Without refusing an academic theatrical education in Rome and Paris, he began to earn his life in the frequentation of carny barkers, crocodile hypnotists, quick-change virtuosos, aerialists, actors, ballet étoiles. Nobody knows why and when producers began trusting in his directorial services, spreading his signature around the globe: from Savary, Brachetti, or Larible; to American sanctuaries as Big Apple Circus or Cirque du Soleil. It is in his hands that Feld dared to put the concept of Barnum’s Kaleidoscape; and the Princess Grace Theatre of Monte Carlo or Spoleto Festival trusted for magic events or Shakespeare stagings. He wrote books and dictionaries about theatre, circus and magic; his signature infestated in the last 20 years major international circus periodicals. Mentalism, training of escapologists, academic lecturing on silent movies are other ways to assure his existence besides writing and directing. Mixing forgotten Martini recipes and tracking theatrical memorabilia are his beloved pastimes.